The summer box is mostly items from The Walking Dead – but you will get one new comic from Steller and a koozie from Redneck. Commonwealth Recreational Dept Shirt – Value $15? The summer exclusive shirt features a new settlement to the comics – The Commonwealth. I’m interested to see how this new storyline develops, and I must say that I was probably too excited to see the gang venture into Pittsburgh in The Walking Dead comics! I think the shirt itself tends to run a bit large in terms of sizing, as well. These are always the highlight of the box for me – but this month, I think the exclusive is not as cool as the normal variant – it basically just excludes the two extra Carl heads. I always have to pose Carl with Rick’s hat! I love McFarlane figures, in general, the articulation is fantastic – so they are very poseable. My little TWD McFarlane army is growing! You’ll get a red variant of the classic Walking Dead comic font. 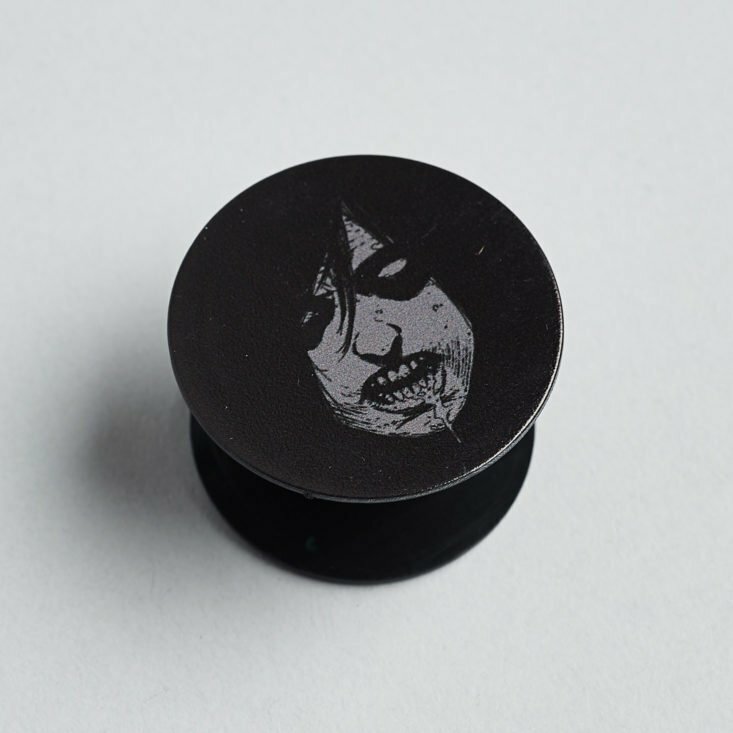 Zombie Pop Socket – Value $10? This is a new product to the subscription – a pop socket for your phone. It’s adhesive, so it’ll stick to your phone. I’ve actually never used one before, so I started using this one and I’m now hooked. Redneck Koozie – Value $5-10? You’ll get a koozie for Redneck comic fans. It’s a fun little play on Budweiser for Redneck comics. This comic follows the character, Stellar, who was created to win a war and is a ridiculous weapon. This issue starts to dive into flashbacks of the war and gives us hints at her true power. Definitely worth a read! Verdict: $60 is pretty pricey for a subscription – but, you’ll recoup about $40 of that cost between the figure and the shirt, which tend to be from The Walking Dead. So, if that is in your fandom wheelhouse, then I think you will tend to get value from this. What do you think of box #7 from Skybound Megabox?